We've just been learning about the Transformational Business Network. This is good stuff and links in with my trip next week to Kampala and Kabale, as we seek out projects to support in the developing world with our Building for the Future Fund. I eventually had coffee with Bishop Onesphore of Byumba this morning. He has invited me to visit him in Rwanda while I am in Uganda. I thought this might be tricky, but it turns out that Brits don't need a visa. It's only a drive of an hour or so from Kabale. Please pray it is possible. There was much busyness at St Silas' last night. The 'Freedom in Christ' course met in the hall. The Soup Run team were preparing to take food to the streets. The artists and techies were preparing the sanctuary for tomorrow's 'Labyrinth' experience (strictly speaking, it's more of a modern day 'stations of the cross' - from the preview, I think it is going to be very moving. 8am-8pm). In the midst of all this, we had our simple little Holy Communion service, complete with our very own heckler. Somehow, it didn't detract from what we were about. Quite the reverse, in fact, as we considered Jesus' words from the cross, 'It is finished' and how the communion meal reminds us how Jesus death completely reconciles us to God, to each other and to ourselves. I then got to join the soup run team who visit the hostels in Glasgow every Thursday night with soup, hot chocolate (and last night, Easter eggs!). To be honest, it's been a long, hard week so far and I was feeling tired. It was worth it, though. Again, it seemed right to be there, and the team was simply amazing. We got praying with some women on the street, which I found very humbling. 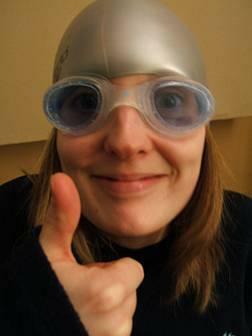 Hello friends, I’m taking part in the National Swimathon for Marie Curie this year. I’m aiming to swim at least 2 miles (128 lengths) on Sunday 25th March. Three other friends from the pool are also taking part and we’d love it if we could raise £1000 between us. Can you guess what’s coming…? I’d be really grateful (and would feel very encouraged) if you would consider sponsoring me for any amount. I won’t be offended in the least if you decide not to but if I don’t ask, I won’t get! You can sponsor me with a bank card using this link or you can wait until you see me – I will have my sponsor form with me at all times over the next few weeks. Many thanks in advance to those of you who can spare some cash!